In the past, Sequoia Nursery has brought you such varieties as Magic Carrousel, Orange Honey, Sheri Anne, Rise N Shine, Red Cascade, Stars N Stripes, Joycie, Sweet Chariot, and others -- at the time far ahead of others (and still good roses). These all came from our research here at Sequoia Nursery (Moore Miniature Roses). Then there are others such as the modern repeat flowering bush type Moss roses. Many of these have been, and are still being used in our breeding and by other rose breeders worldwide. So the dreams of Ralph Moore are still very much alive and are a part of a good share of the miniature and striped roses now being bred around the world. And the end is not yet. The first repeat flowering yellow rugosa, Topaz Jewel, also came from here as did the popular red rugosa Linda Campbell. The rugosa roses have long held an attraction for me because of their breeding possibilities. And there are still more exciting things among our rugosa rose hybrids. Some of our latest crosses have produced plants which might be used as ground cover plants. An interesting hybrid we have been watching is a bushy, spreading plant with miniature rugosa foliage and pointed soft pink buds (mossed by the way), opening into soft pink semi-double flowers. It is constant repeat flowering in sprays or clusters and the clean green foliage is definitely rugosa. 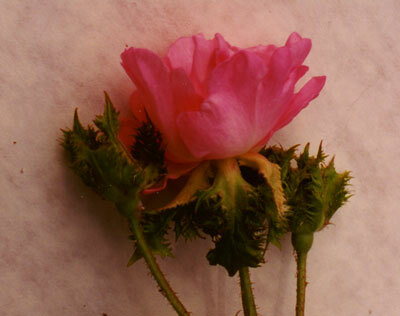 One of the latest breeding surprises is a thornless rugosa. The plant is of vigorous, upright growth that is free of thorns or prickles on the stems and foliage! This is still in testing stage. Still this is not all that will be forthcoming from Sequoia Nursery -- the dreams of Ralph Moore. For some time we have been working also with the species, Rosa bracteata and hybrids. The first of these, Out of Yesteryear, was introduced by Wayside Gardens (now also available here at Sequoia Nursery). It is an everblooming shrub rose with very double, cream-white, 2 1/2-3 flowers of OGR (Old Garden Rose) form. From this and other R. bracteata crosses we are developing a line of repeat flowering, climbing and bush type roses. Some of those are now on trial. And there is yet more in the making. 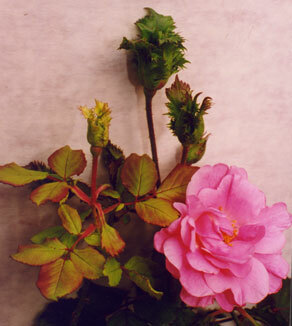 One of the most interesting to me is the progress of work with the crested type roses (Chapeau de Napoleon). This has been a most difficult labor of love over a period of 35 years! From the first crossing of Little Darling x Chapeau de Napoleon (Crested Moss) which produced the two spring flowering shrub/climbers, Crested Jewel and Crested Sweetheart, to the present has taken 35+ years, mainly due to sterility or low fertility problems and a low rate of seed germination. But now we seem to be nearing the end of the tunnel... there is light ahead! We are now testing several possible varieties with very interesting cresting on the buds (pointed buds wrapped in green lace). Then there are the HALO Roses which originated here. We have now combined them with one of Jack Harkness Hulthemia (R. persica) hybrids. These are exciting possibilities but we are looking forward to what will happen next. Please dont rush us as even though we now have many of these roses under test and observation, it does take time to build up quantities sufficient to release to the public. Reprinting, use or distribution of this article is prohibited without prior approval from its author(s). Copyright 2019 by Ralph Moore, all rights reserved. HelpMeFind's presentation of this article is not an endorsement or recommendation of the policies, practices, or methods contained within.